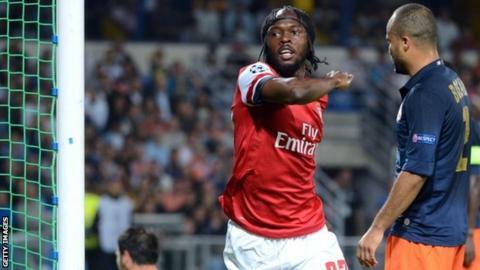 Arsenal opened their 15th successive Champions League campaign with an unconvincing victory as they came from behind to beat Montpellier. Younes Belhanda's chipped penalty gave the French champions the lead on nine minutes when captain Thomas Vermaelen conceded on the edge of his area. Since August 2004, Arsenal have conceded 11 Champions League penalties - more than any other team. Abou Diaby was booked after 21 seconds against Montpellier, the quickest Champions League yellow card since Paulo Jorge in November 2009. But two goals in three first-half minutes turned the game on its head. First Lukas Podolski levelled with a calm finish, before Gervinho poked in a from close range two minutes later. It was a night to forget for Olivier Giroud, who left Montpellier for Arsenal in a £13m deal over the summer. The 25-year-old had been desperate to shine on his return to a club where he won the French title and the golden boot last season but Arsenal were some way short of full capacity all over the field. They worked hard, counter-attacked intelligently, using the energy of Abou Diaby and the guile of Santi Cazorla, and finished decisively but it was not a classic performance from Wenger's team. It did not have to be, but for much of a breathless second half a tired Arsenal side were left hanging on with a late Montpellier penalty shout controversially waved away by referee Carlos Velasco Carballo. The result leaves Arsenal in control of Group B, level on points with Schalke. Arsenal had never lost to Ligue 1 opposition in eight previous European matches. That, coupled with the vast European experience of Wenger's side - the last season in which they did not compete in the Champions League was in 1997-98 - against opponents making their debut in the competition, pointed towards another encouraging night for Arsenal. "We looked a little tired in the second half because it was very humid and the crowd got behind them. It is quite an intimidating place to come and play, so we are glad to get the result. "We have had a decent start to the season and we have kept the run going, so it's important all round, for the whole season." And yet with Wenger starting a three-match touchline ban for confronting referee Damir Skomina after Arsenal's Champions League exit last season at the hands of AC Milan, there was also a measure of uncertainty. Assistant manager Steve Bould took charge from the sidelines, having been promoted from his role as the under-18 academy coach in the summer. The Premier League side had also looked the more vulnerable in the opening stages, with Vito Mannone continuing to deputise in goal for the injured Wojciech Szczesny and the inexperienced duo of Carl Jenkinson and Kieran Gibbs at full-back. Vermaelen heaped further pressure on his team-mates with a clumsy and unnecessary challenge on Belhanda that led to a ninth-minute penalty. The Montpellier midfielder had been running away from goal when the Arsenal captain ended his progress with a tangle of legs. Belhanda's chipped 'Panenka penalty' was dispatched with an air of arrogance. And yet it was at that moment that Arsenal moved up a level, striking twice in the space of three minutes to silence the Stade de la Mosso. The first came after a sweeping passing move that began with Diaby and ended when Cazorla combined with Giroud in the inside-left position. The latter's first-time pass freed Podolski in space behind the Montpellier defence from where he slid the ball beyond goalkeeper Geoffrey Jourdren and into the net from 12 yards. It was the German striker's third goal in as many games. The force was with Arsenal now, another sweeping attacking surge saw Gervinho and Jenkinson combining down the right before the young Englishman curled a teasing low cross which his team-mate prodded over Jourdren into the net from close range. And yet there was still a feeling that Arsenal were vulnerable. With Montpellier sensing that at the start of the second half, Diaby attempted to run the ball away from his own penalty area. Remi Cabella picked his pocket, only to fire his shot high and wide of Mannone's left-hand post from 10 yards. Cabella was at the heart of Montpellier's revival. Five minutes later his impudent chip thumped the Arsenal crossbar as the home supporters found their voice. The French champions continued to pour forward, Belhanda somehow firing straight at Mannone from eight yards. The referee waved away another late penalty shout by Montpellier as the irrepressible Cabella went to ground under Diaby's challenge. But Arsenal somehow stood firm.